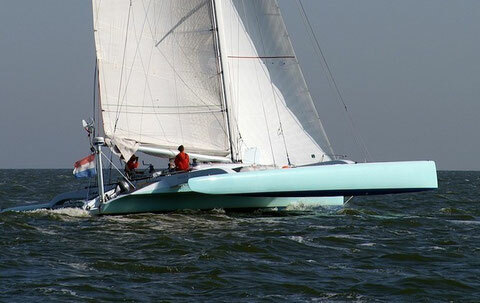 The boat in the photo is Yana, the TR40 design of which a small number were built in the early 1990's. The TR40 was inspired by my experience cruising, racing, and living aboard my 33' trimaran Yellow Bird in the early to mid 1980's. 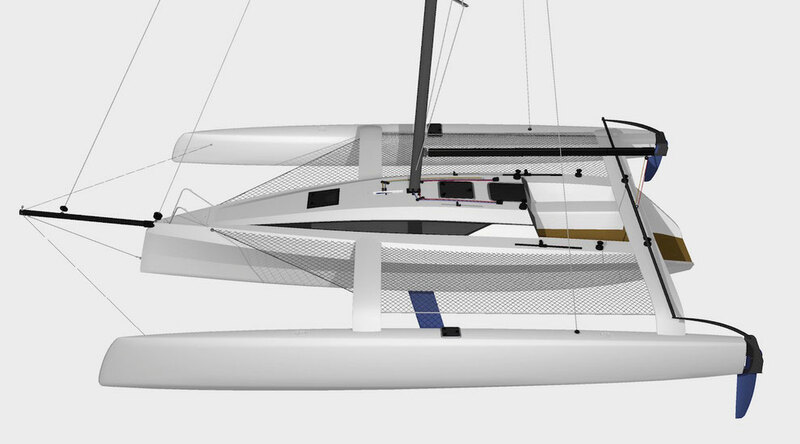 Regretfully no TR40's were built in Australia and to this day I have not had the opportunity to sail on one, although I have raced and cruised on the smaller Spoon Bay 10.6 which I designed just a few years earlier. The TR42 is a current day version of the TR40. 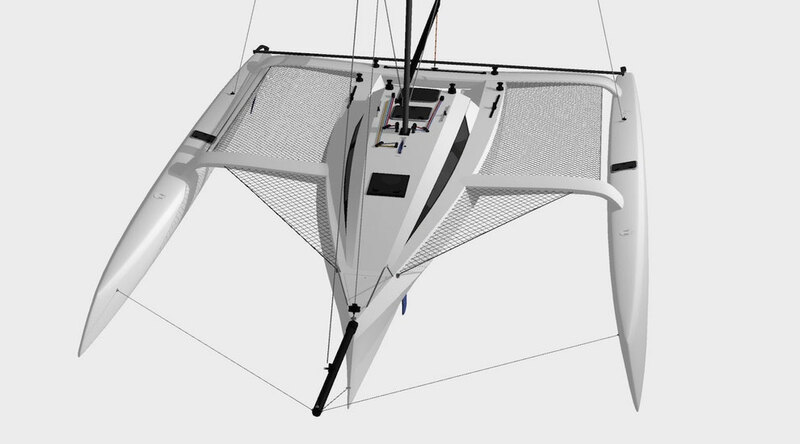 Float shapes have evolved, the centre of gravity has moved aft, and we'd prefer twin rudders because boats tend to get driven harder these days and you need the extra bite when you're flying the main hull. 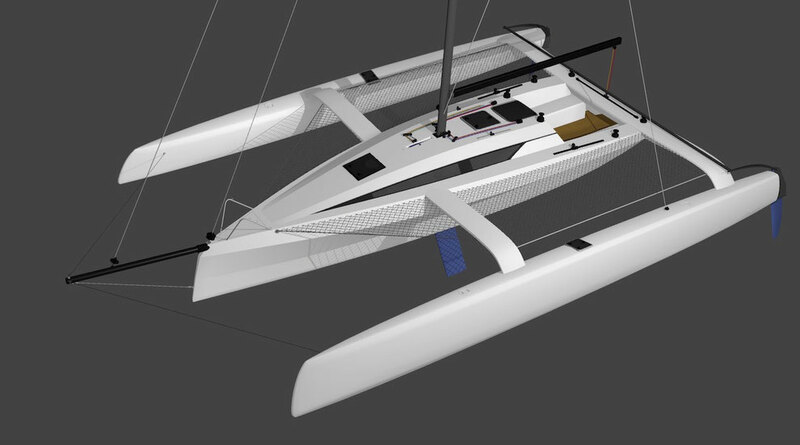 The design is very similar to the Rocket Factory trimarans, with the main hull, decks and cabin all built in kit form from flat panels. It could be a Duflex kit, or you could build the whole boat from full size patterns over temporary moulds. 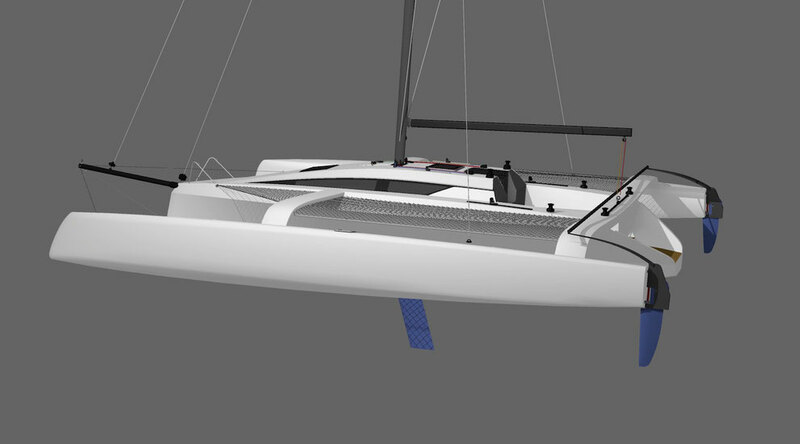 For a more bare bones high performance version of this design see the R40 here. TR42 is available in aft cabin and open cockpit versions and some variations on the internal layout are possible in both versions. 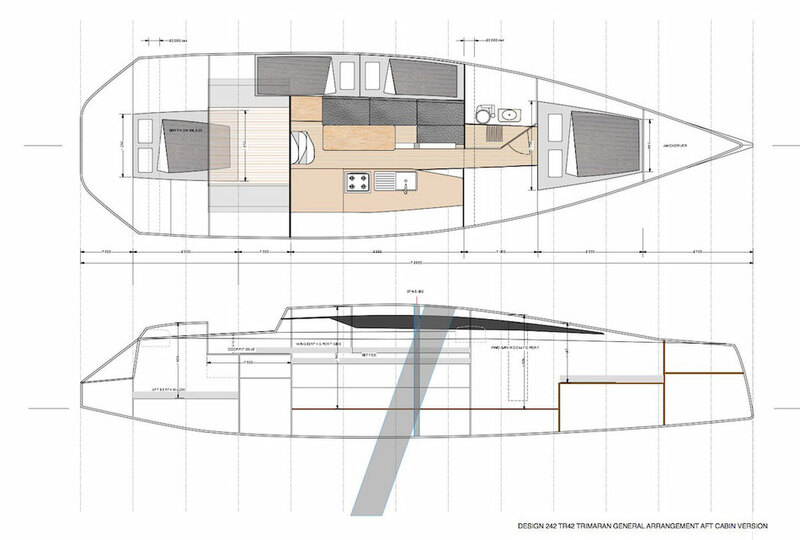 TR42 Trimaran Layout with single forward bathroom. The arrangement in the main saloon is interchangeable with the aft cabin and open cockpit versions. There is quite a bit of flexibility with the layout on the TR42, for both the aft cabin and the open cockpit versions. I have presented these two options as a starting point. I have a personal preference for quarter berths while at sea, as I've stated elsewhere, but the aft cabin serves the same purpose. It gives quick and easy access to the cockpit if you're single handing or short handed. For the aft cabin version I've moved the cabin forward from the transom a bit to make room for a boarding platform, dinghy stowage, and offering the option of using an OB motor as an auxiliary. One advantage that comes from moving the forward beam and dagger case aft compared to earlier designs is that it provides a lot of space in the forward cabin. There is ample space to fit a head and shower forward of the beam BH and the forward berth is 1.5m/5' wide. If you wanted a private owner's cabin forward it is possible to fit a second head and shower behind the dagger case in the saloon as shown in the open cockpit layout. This arrangement can also be used on the aft cabin version. 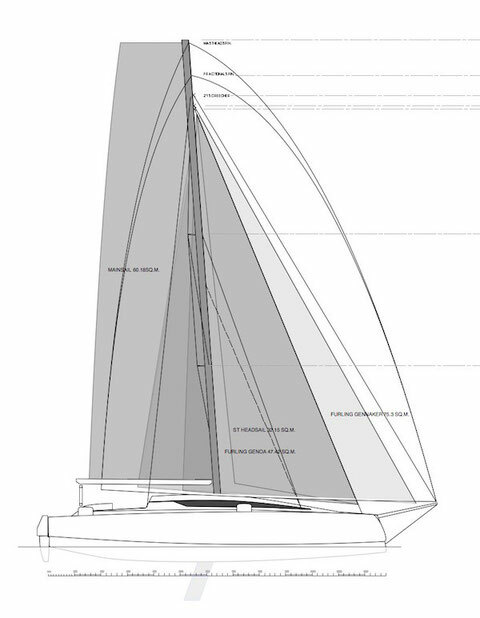 Beam Main Hull 3.56m 11'8"
Height of Main Hull 2.55m 8'4"
Enquire for pricing on plans, kits, and built to order ready to sail.